Porsche has amassed a grand total of 19 victories at the famed twice-around-the-clock race in rural Northern France, far more than any other manufacturer. For decades they have been involved in the 24 Hours of Le Mans, and for decades they’ve been successful in their efforts. Synonymous with Porsche’s victories are their celebratory victory posters, each one iconic and evocative in its own right. 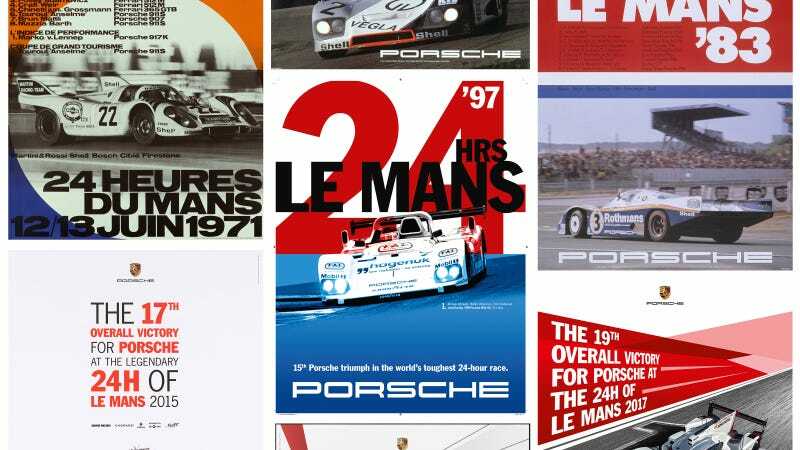 Here are my ten favorite posters, commemorating my ten favorite Porsche Le Mans wins. Porsche faced the might of Ferrari’s factory-supported V12 screamers and didn’t shy away from the challenge. Porsche entered five 917s and ultimately only two finished the race. Their persistence paid off as they swept the podium, with the Salzburg 917 taking the victory. That this was Porsche’s first overall Le Mans victory, and by extension first win poster, makes this one all the more special. The motion blur on the now-famous Salzburg 917 combines well with the imposed checkered flag motif, making for a great visual. For 1976, Porsche installed a 2.1-liter variant of the 935 engine in an updated version of the 917 chassis and dubbed it “936” for the Group 6 class it would compete in. By the close of the race’s first quarter, the van Lennep and Ickx car had checked out and would never be caught again. The 936's high-mounted air intake box is the focal point of the car, and it made ever more pronounced in the poster as the car crests a hill on circuit. The text frames the car well, pulling your eye to the right of the frame, directly at the oddly-proportioned, yet somehow still beautiful, Porsche prototype. Jacky Ickx desperately wanted to score his fourth Le Mans win in 1977, and to do so, he was entered as a driver in both factory/Martini-supported 936s. The strategy paid dividends, as the #3 car suffered an early race failure, so he refocused his efforts on the #4 sister car, shared with Jurgen Barth and Hurley Haywood. In the final hour, the leading 936 came into the pits billowing smoke from a broken piston, where the team mechanics removed the ignition and fuel to that cylinder. Running on just five of its six cylinders, the 936 crossed the finish line with its win intact. Compared to the other posters Porsche made, this one is a bit simpler, but the story of the race, and Jacky’s dedication, is too good to not tell. A simple snapshot of the winning 936 driving through long shadows superimposed with the results of the 77 Le Mans, this poster is much more straightforward than its visually exciting brothers. With none of the prototype class cars making it to the finish without a lot of time spent on pit lane, it was the Group 5 Porsche 935s that dominated the race, finishing 1-2-3 with a single 934 in fourth. The Whittington brothers were known for throwing (allegedly ill-gotten) money at programs, and they hired Kremer Racing to help them win at Le Mans. There are rumors that suitcases full of cash were delivered to Erwin Kremer in order to facilitate the deal. It’s difficult to pick a favorite poster, but this might be mine. Adorned with a backdrop of French Tricolore flag motif, a high-angle perspective of one of the greatest Porsche 911s to ever race, this poster is a true classic. With new ground effects downforce technology, the 1982 956 was a clean and sleek missile of a car, but still had as much aero grip as any driver might need. Porsche secured a 1-2-3-4-5 finish, led by a trio of these factory-entered 956s. Porsche issued a few different iterations of its 1982 victory poster, but this one depicting a trio of 956s is my favorite. The poster touts the fact that the 956 was voted the most beautiful racing car, and it’s difficult to disagree. This was a year of pure dominance, plain and simple. The 956 chassis had proven itself to be quite fast in the hands of true pros, but also quite easy to drive for the gentleman drivers, making it a great choice for privateer entrants. More than half of the cars classified at the finish line were Porsches, and they locked out nine of the top ten positions. Perhaps the most iconic of Porsche’s Le Mans victory posters, the “Nobody’s Perfect” tagline with a simple list of results below illustrates the point better than any full color photograph ever could. When your cars finish 1-2-3-4-5-6-7-8-10, you want the world to know. Exploiting a loophole in the rules, Porsche and Dauer pulled off a great manipulation to allow their Group C 962 to race again as a GT car. Because Porsche and Dauer worked together to build a street-legal version of the 962, it was technically eligible, and technical eligibility is the best kind of eligibility. With a higher ride height, narrower tires, and a flat floor, the Dauer didn’t handle as well at-speed as the earlier ground-effects 962s, but it was better and faster than anyone else that year. A simple, very ‘90s design, with era-appropriate color blocking and vivid fully saturated colors, there is no better way to commemorate Porsche’s 13th victory. This was the Joest team’s second consecutive victory with the same chassis WSC-95, and the first of Tom Kristensen’s record-setting nine overall Le Mans wins. The Porsche factory-entered GT1s and McLaren F1 GTRs all experienced a variety of failures, allowing this older and slower car to slip through to victory. Even though their engines powered the Joest to victory, Porsche was a bit disappointed with their 1997 effort as the factory-supported GT1 was not the successful one of the bunch. As the “wrong” Porsche won the race, the factory never actually produced a 1997 victory poster. A few years ago, Porsche implored fans to create a design as part of a competition, and this was the winning design — thus the anachronistic look. Having spent significant time, effort, and money developing the 911 GT1 into a race-winning car, Porsche was finally successful in the third year with a third completely new chassis design. This was a particularly difficult Le Mans to win, given all of the other factory-supported racing teams in attendance. Mercedes-Benz, Toyota, and BMW were all much faster cars, but suffered failures early, while the McLarens and Nissans couldn’t match the Porsches on pace. The 1998-winning GT1-98 is one of the most wild-looking racing cars Porsche has ever produced, with pronounced quasi-996-esque features and elongated rear haunches. In the poster, the car looks like a spaceship sent from planet Stuttgart to dominate Le Mans. Visually, the car stands on its own, juxtaposed with a simple white background and some block lettering. Porsche’s first win in 17 years came in just the second year of the 919 Hybrid’s development. The team entered a fleet of three 2-liter V4 carbon monocoque hybrids, ultimately finishing first, second, and fifth. The winning #19 car ran a flawless race with excellent pace, holding a steady lead over the Audi camp. Porsche’s first win in the modern era of LMP1 also came with their first modern poster design. Porsche’s three runners in 2015 were given similar liveries in three different colors: red, white, and black. Porsche played on this color trio to give the poster a set of stripes reminiscent of a car gradient. And don’t think we forgot this year. 2017's 24 Hours at Le Mans was Porsche’s 19th overall win. To find out more about the commemorative artwork behind all of Porsche’s historic victories — from Le Mans to Sebring — watch the video below.